Police in Montgomery County have arrested two Pottstown teens for shooting at the home of a middle school girl's family. 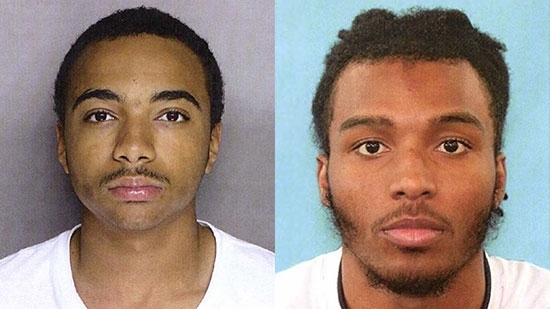 19-year-olds Ahnile Fountain and Makael Bevins, both of Pottstown, are charged with attempted murder, firearms violations, and related offenses. It happened around dinner time on March 24th on the 500 block of West Street. 15 shots were fired through the front of the home. The parents and all five children inside were not hurt. Marie Samba, the mother, said that a group of 8th grade girls had been taunting and bullying her 13-year-old daughter at Pottstown Middle School for several months. She believes the shooting was related, "My 13-year-old has a hit on her, from a bully? What possesses a grown person to take a 13 year old's word to shoot up a house full of people?" The family's attorney is looking to see why the bullying persisted for so long at Pottstown Middle School without intervention from school officials. Samba has removed her children from the school. She does feel sorry for the suspects and their families. She says, "To see all those charges on them. I just pray that they can get the strength because that's a lot. It's a lot on their moms and their dads." On Monday, 4/8, Philadelphia District Attorney Larry Krasner filed a motion in all open cases under Common Pleas Court Judge Scott DiClaudio demanding the judge recuse himself. The judge canceled his entire docket of 39 cases on Tuesday. Krasner claims that "a reasonable person would question Judge DiClaudio's impartiality in any cases in which the Office represents a party." The District Attorney's Office claims that DiClaudio may have a conflict of interest with prosecutors after his girlfriend, former Assistant District Attorney Catherine Smith, was fired in February and she filed a complaint with the Pennsylvania Human Relations Commission. All of those cases now must be rescheduled. On Wednesday afternoon, 4/10, Philadelphia District Attorney Larry Krasner announced charges against two Philadelphia tow truck operators stemming from an 18-month grand jury investigation. 47-year-old Joseph Moreno and 29-year-old Dwight Williams, co-owners of towing company Hooked Inc, are charged with corrupt organization, deceptive business practices, insurance fraud, theft by deception and conspiracy. They both voluntarily turned themselves in and were arrested back on March 19th. They are accused of overcharging insurance companies and taking advantage of vulnerable drivers with unfair towing and storage rates. "I hope today's announcement sends a clear message to area towing operations to follow the law because these scams have no place in our city," Krasner said.